Location: 310 West Stephen Foster Ave.
Sundays — Sat evening: 4 p.m.; Sun: 7 a.m., 9 a.m., 11 a.m.
Daily — Mon–Fri: 6:30 a.m.; Mon: 11 a.m.
A log structure named St. Joseph’s Church was erected in 1798 in the northwest corner of what is now St. Joseph’s Cemetery. Benedict Joseph Flaget, first bishop of the Diocese of Bardstown, began constructing the first cathedral west of the Alleghenies on July 16, 1816. It was dedicated on August 8, 1819. John Rogers, formerly of Baltimore, is credited with the design and construction of the cathedral. Raising this neo-classical church of impressive proportions (138’ long x 64’ wide, 60’ high) was an amazing feat on the frontier. Limestone foundation blocks were quarried, and bricks were fabricated nearby. Kentucky’s forests supplied timbers, sheathing, and shingles. The portico, with monumental ionic-style columns, and the 140-foot steeple, supporting a Belgium-made bell (later recast), were completed in 1826. The present Seth Thomas steeple-clock was installed in 1911 and has been refitted with electric works. When erected, St. Joseph Cathedral was among the country’s largest buildings, second only to the nation’s Capitol. Protestant donors were so generous that their contributions outweighed those from the Catholic community. Liturgical items and artworks came from Europe. King Francis I of the Kingdom of the Two Sicilies gave Bishop Flaget several valuable paintings, including The Martyrdom of St. Bartholomew, painted by Mattea Preti (1613-1699). Belgian missionary Father Charles Nerinckx may have facilitated the gift of Mathieu Ignacc van Bree’s large Crucifixion, which hangs over the altar. The seminary located at St. Thomas moved to the upper floors of the cathedral’s new rectory. Spalding Hall was built in 1825-26 and was used as St. Joseph College for many years. After a disastrous fire early in its history, the Hall was rebuilt within the same walls. That building has been a boys’ college, a hospital serving soldiers from both sides during the Civil War, an orphanage, and finally in 1911, St. Joseph Preparatory School for boys. Since “The Prep” closed in 1968, this fine old structure has had varied uses, including a museum, a restaurant, offices, and apartments. With the advent of the steamboat, Louisville replaced Bardstown as the growing metropolis, and Bishop Flaget moved his see to Louisville in 1841. St. Joseph then became known as the proto-Cathedral, meaning first cathedral. St. Joseph’s community of nearly 5,000 parishioners maintains and operates the oldest standing cathedral in the United States, provides Catholic education through its elementary and secondary schools, and assists Nelson County’s poor citizens with furniture, clothing, and food through its St. Vincent de Paul Society chapter. St. Joseph Elementary School opened in 1953 and was staffed by the Sisters of Charity of Nazareth. Bethlehem High School had its beginnings in 1819 as an elementary school and in 1911 added a girls’ high school to complement St. Joseph Preparatory, where the Xaverian Brothers educated boys in Spalding Hall. When St. Joseph Elementary opened in 1953, Bethlehem became a girls’ high school until 1970, when it began admitting boys. (St. Joseph Preparatory closed in 1968.) 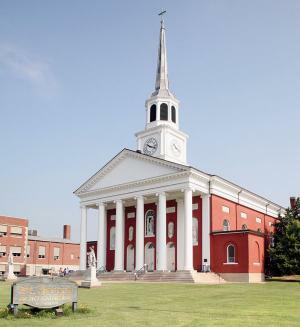 Bethlehem is the oldest continuously operating Catholic school in Kentucky. Today, as the only Catholic high school in the Archdiocese outside of Louisville, it serves students from many surrounding counties. Finances have been successfully managed to operate all of these facilities, while maintaining the Proto-Cathedral. Recent projects include the installation of a new copper roof, preservation and improvement of the 3,600-pipe organ, and remodeling of Flaget Hall for staff offices and pre-school facilities. Resident clergy, a pastoral staff, and more than 150 full-time and part-time employees and teachers collaborate in responding to the spiritual needs of the laity, including students, and managing daily operations. In 2001, Pope John Paul II recognized St. Joseph’s historic character with the special title of minor basilica. This designation forges a special link with the Pope, expressed particularly in the Basilica’s liturgical prayer life. The United States Congress Historic American Buildings Survey listed it in 1934. The Kentucky Heritage Commission has designated it a state landmark. St. Joseph’s congregation has roots more than two centuries old. It now serves Bardstown and Nelson County, supporting many community needs from cradle to grave. This historic faith community is committed to dedicated service long into the future.